From October 2017 to September 2018 we ran a weekly group for 30 sessions, each group session comprised of 3 hours ( 90 hours). The group sessions took place in our group room/kitchen space at Multi Cultural Family Base. We transported the girls to the sessions ( Mondays 3.30 to 6.30pm) and dropped them off home after the group. Eight girls from a wide range of different Black and Minority Ethnic Communities attended on a regular basis. Over the year a total of 12 girls attended the sessions. The girls were either referred directly to the project from other agencies or their families were already known to the agency. Over the summer holiday period the group went to several shows at the Edinburgh Fringe Festival. We placed 4 Social Work students in the group throughout the year. They made valuable contributions as well as taking learning about young Black Minority Ethnic Carers on into their future careers. The group sessions at Multi Cultural Family Base, are based on the agency's group work model which offers peer support, shared experiences, respite from caring and opportunities to explore their identities as young Black Minority Ethnic women. The group were involved in dancing/ music making, sharing food, arts and crafts activities, self care activities and discussions about topics which are important to the girls. Our Project addressed the three Creative Breaks priority areas, Choice and Control, Outreach in targeting Black Minority Ethnic Young Carer and Joint Work. The project's successes included the ability to attract carers from a wide ethnic diversity. This included girls from Syria who were providing care in their family for parents who had been disabled by war conflict, as well as being affected by Post Traumatic Stress Disorder. Several of the girls are making more use of mainstream services. For example, one girl won an award for her involvement in a work scheme organised by her school and another girl is now involved with the Stills Gallery. Other girls have achieved academic success and their have been significant developments in several girls' confidence, whereby they have been able to take on leadership roles. Two of the older girls act as mentors and role models to the younger girls, offering advice and support when needed. The needs of Black Minority Ethnic Young Carers are often masked by other professionals as their role can be attributed to cultural factors. This can diminish concerns about the impact of the role on the young women. We have learnt about the ways in which friendships can be made and young women can participate in a group even when they have limited confidence in speaking English. It has enabled us to more clearly identify the impact of caring on young Black Minority Ethnic people and particularly for new migrant families when young people often act as ‘cultural brokers’ for their parents. It has enabled us to provide a broad ‘suite of services’ for Black Minority Ethnic young people. It has also enabled us to further develop our group work model with an older age group, as many of our other groups are for younger children. The work has also helped us make more links with other agencies who have a specific role in working with carers. 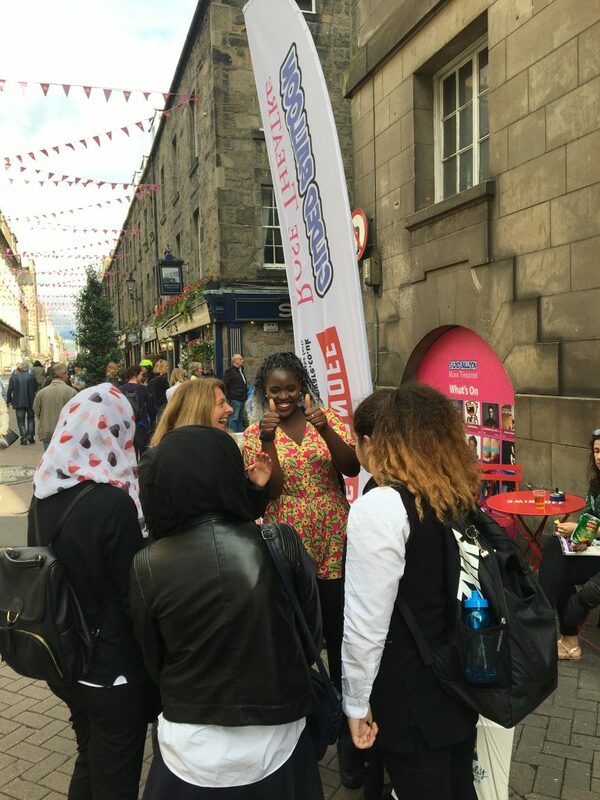 12 young female Black Minority Ethnic carers who live in Edinburgh will feel more confident, have improved peer relationships and be more able to explore and articulate their feelings. We have seen each of the girls grow in confidence during the course of their involvement in the group. Girls who were quieter and shy are now able to speak up more in the group initiating topics for discussion such as bullying, racist abuse, sharing different cultural experiences/practices, difficult peer relationships at school to name a few. There has been a very significant improvement in many of the girls spoken English too. Older girls in the group have been observed being helpful and supportive of the younger, newer members of the group sharing the benefit of their experience of the group and of life in general. Shared experiences of discrimination and racism, bullying, negotiating social media, difficulties at school have been a regular feature of group discussions allowing for there to be support and addressing the sense of isolation. B aged 13 years old and is a refugee from a Middle Eastern Country. She is a carer for her father who was disabled as a result of war conflict. Her mother suffers from Post Traumatic Stress Disorder. When she first joined the group she was very shy and tended not to get involved in activities, relying on her phone to avoid feeling the awkwardness of being on the fringe of the group due to her limited English. 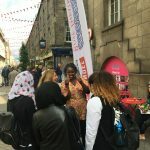 This has changed considerably in recent months and with the help of some of the girls who could translate some Arabic and use of Google translate, B has started to share more of her experiences as a carer and joined in conversations about a range of topics. She attended an outing to see a musical during the Edinburgh Festival. She has become more inclined to make direct contact with other girls, one girl in particular who despite having limited English herself has found a way to communicate using sign language, phones and engaging in an activity together. Both girls also attend an English class out with school. During the Festival outing both girls were seen to be laughing and enjoying each others company despite their lack of mutual language. B is now more inclined to engage with the other girls and has on occasion initiated conversation herself. Recently the group spontaneously celebrated B’s birthday in response to which she showed very natural joy and excitement. This was very significant given her earlier experiences of being in a country at war, suffering losses and being a refugee. 12 young female Black Minority Ethnic Carers who live in Edinburgh will have tried new experiences. 10 young female Black Minority Ethnic Carers will be more to go to other venues and be better prepared to join mainstream activities. 2 young female Black Minority Ethnic Carers will be able to act as peer mentors for the younger girls. There have been several activities organised which have enabled the girls to have new experiences over the past year. Music workshops with the Cannongate Youth Music Café, involvement in a photographic exhibition on the theme of equality, which culminated in going to see the completed exhibition was an enjoyable and meaningful experience for the girls and completing and contributing art work for Leith’s Window Wonderland which was met with pride at having their work on display in a shop front in the local area. They also prepared and ate nutritious foods they may not have otherwise had access to. This was particularly important as one of the girls had quite severe tooth decay brought on by excessive consumption of sweet foods. One of the girls in the group was involved in a school work experience programme l which resulted in her getting an award for her reliability and dedication. The same girl also joined a programme to promote healthy eating and gave a presentation to peers. H is a 13 year old Pakistani girl and was recently filmed for a video made to promote the work of the agency where she shared her experiences of being part of the group and agency as a whole. She takes on caring responsibilities in her family as her mother has renal failure and attends regular dialysis. In the video she talked openly and candidly about how she felt safe sharing her worries and what happens outside in the context of the group. Despite being quite reserved and shy when she first joined the group she has talked openly about racist abuse her family experiences especially given that they are Muslim. After the interview for the video the young person said she would like the opportunity to talk more about the experience of being Black Minority Ethnic and the importance of having a group to go to. Despite some of the fear of sharing personal and family experiences with the outside world H has talked about her views about more contentious issues such as arranged marriage and domestic abuse which has happened to a close relative. Other professionals and agencies are more aware of the needs of Black Minority Ethnic Young Carers. We have had an impact on social work students understanding of the needs of Black Minority Ethnic Young Carers. We are a training agency for social work students and work with 35 students per year who come to Multi Cultural Family Base from programmes across Scotland. Four of these students were directly placed within the project. From their placements they were able to better understand how the needs of the young women might be missed or over attributed to cultural factors. They will take this learning with them as they progress towards their professional qualification. Alongside our direct work with students we also delivered a lecture at Edinburgh University for 50 social work students where we focused on the role of children/young people in acting as ‘cultural brokers’ for their parents which highlighted the work of the Yolo group.